Bathroom Organization Tips - Home Organize It! 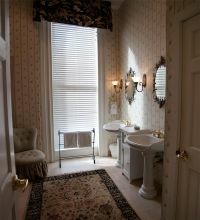 The bathroom is quite often the smallest room in the house, and often the most cluttered. It can be a challenge to find any extra space in the bathroom, so you will need to think outside the box. Luckily, these bathroom organization tips can help squeeze more things into a small space. Evaluate the amount of bathroom storage space that you have. Do you have a cabinet? Closet? Just the area under the sink? There are many options for maximizing these spaces. Start by going through all the medicine cabinets and drawers and throw away anything that is out of date, including old makeup. This frees up some space to reorganize your things, as well as getting rid of things that are no longer safe to use. When you re-organize your drawers, you can add organizer trays. These keep things easy to locate in the drawer and from rolling to the back. Put the things you use most often at the front, and the larger or lesser used items toward the back. Adding shelves can provide more bathroom storage. There are shelving units that are specially designed to go above the toilet. These are perfect for soaps, shampoos and other bath supplies. Nice baskets can help keep things more organized and look better on the shelf. You can also stack extra towels and washcloths on the shelf. Cleaning supplies are usually stored under the sink. This area easily gets cluttered and forgotten about as the door gets shut. For more bathroom organization, try getting a cleaning caddy to keep everything on. They have places for spray bottles, sponges, rags and other supplies. You could even store the supplies with the other household cleaning supplies, leaving more space under the sink for other things, like extra towels and paper products. Counter tops are often cluttered. The key is to only have the minimum of things on the counters. If there is something your entire family doesn't use all the time on the counter, find a new home for it. If you have enough drawers, give each family member their own drawer to put their things in, instead of leaving them on the counter. By adding hooks to either the back of the door or the wall it helps keep towels, robes and clothes up off the floor. It also helps prevent towels from piling up and getting mildewed. It may be a bit more difficult to keep bathroom organization in check than some other rooms, since everyone uses it. However, if everyone helps keep their own things in order, it will make it that much easier. Return from Bathroom Organization Tips to Home Organize It!